Enjoy the meals proudly prepared by our chief chef with food in season. 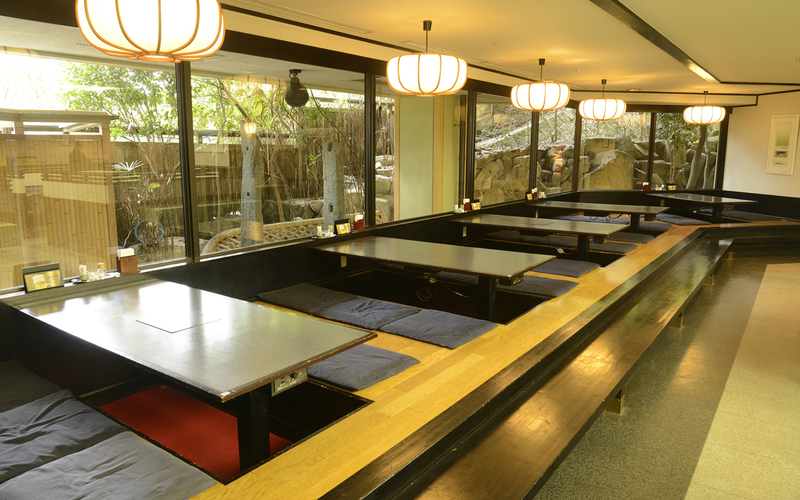 Breakfast for staying guests and lunch for public is served at our cozy Japanese style restaurant Ōmoto. As all seats are non-smoking, guests who smoke the tobacco should use the smoking section inside the hotel. The dinner time for guests staying is 2 hour system between 18: 00-21: 00. We will arrange for that time at check-in time. Please contact us in advance if you have hope for meal start time. You can have a wonderful time at this restaurant. 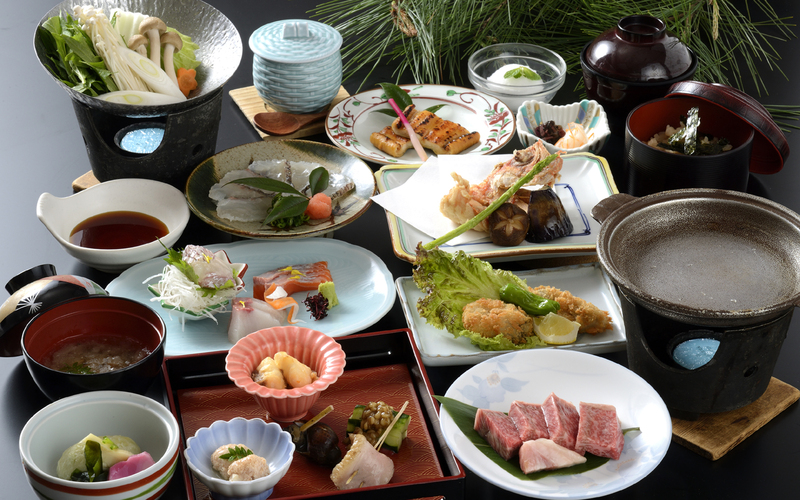 Standard kaiseki for enjoying seasonal ingredients from the Seto Inland Sea at here. Our kaiseki cuisine, and traditional multi-course Japanese dinner includes ingredients in seasonal fresh seafood and meats. Sightseeing guests are also available. Enjoy a variety of Japanese and Western foods, rice, fruits and homemade original dishes. Coffee, tea and other drinks are also available. You will have a taste delights of the foods you can only experience here. We offer breakfast with good nutrition balanced. 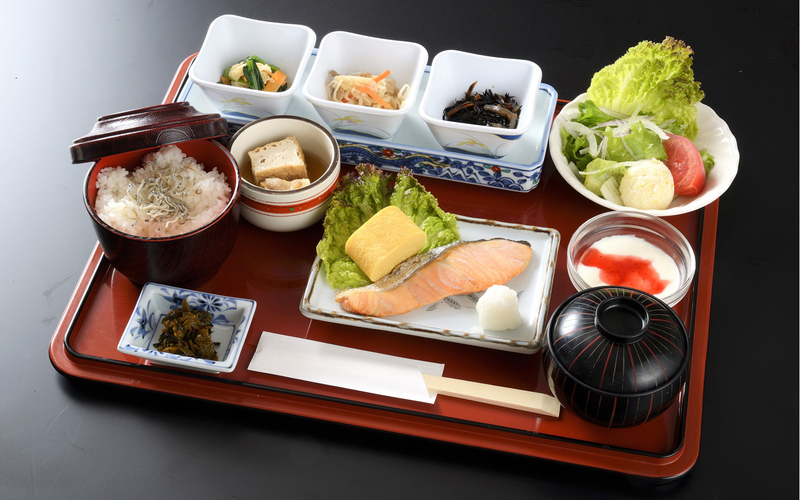 The guests staying overnight at our hotel(Inn) can have our Japanese-style breakfast. Please note that the breakfast fee will not be refunded in case of cancellation for your personal reasons. *The prices do not include sales tax. *Please be aware that we may not be able to obtain the ingredients for certain dishes due to the weather or supply issues. Please come to Miyajima to eat something delicious. Fish from the Seto Inland Sea are well known for their plump flesh and full flavor. Our cuisine focuses on seafood from the Seto Inland Sea so guests can fully enjoy the best seafood in season from around Hiroshima. These dishes are made with full heart.